A number of well-known manufacturers of push and riding lawn mowers employ Briggs & Stratton engines, including Craftsman, Toro, Poulan Pro, Troy-Bilt and John Deere -- to name a few. If your lawn mower features one of these engines, you shouldn't have to expend much effort to get it started. At the most, a few pumps of the priming bulb or -- if you have a riding mower -- disengaging the riding and cutting gears are all that's usually needed. If you're having trouble, you may need to conduct a few maintenance procedures that you might have neglected for a while. A Briggs & Stratton lawn mower engine almost starts itself. Check the manual that came with your mower to determine the type of ignition system it has. If it's a Smooth Start or Prime 'N Pull system, you need to prime a cold engine. You don't need to prime if your mower has a Ready Start or Smooth Start Plus system. Locate the priming bulb. It's prominently placed on the side of the engine and is covered with a rubber cap. Pump it three times, pausing after each pump to allow fuel to enter the carburetor. Squeeze the handle lever to disengage the engine brake, if there is one. Grasp the handle of the starter cord, and pull sharply. The engine should turn over on the first pull, but if it doesn't, pull repeatedly until it does. 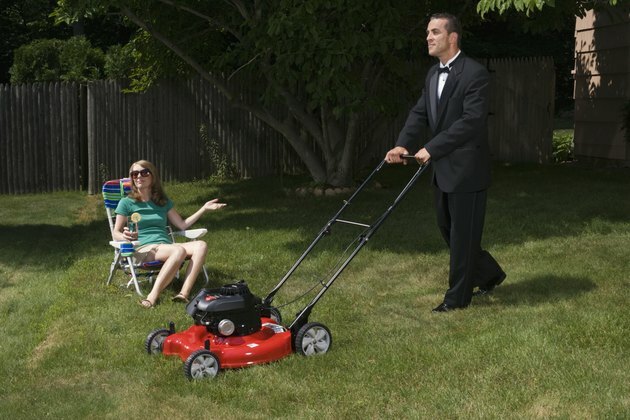 If the engine doesn't start after five pulls, and you smell gas, let the mower sit idle for 10 minutes. The carburetor is probably flooded, and it needs to drain. Start a mower equipped with the Ready Start Electric ignition system by turning the key to the Start position. No priming is necessary. Release the key and engage the throttle as soon as the engine turns over. Sit on the seat of the mower. Most riding mowers are equipped with an emergency control that stops the engine when the seat is empty. Depress the clutch/brake pedal, and engage the parking brake. Then set the motion control lever to neutral (N). Move the blade lever to the disengaged position; set the throttle to fast, and move the choke to the full choke position. Insert the key, and turn it to crank the engine. Release the key as soon as the engine turns over, and set the choke to the off position. Remove the spark plug boot. Unscrew the plug and clean the terminals. Replace the plug if it's corroded or excessively dirty. Check the air filter and clean or replace it if necessary. Remove the fuel filter from the gas tank and replace it if it's dirty. Drain the fuel and replace it with fresh fuel if you're having trouble starting your mower in the spring after a long storage period.